Richard is a gifted thinker and speaker that is of the Lakota Sioux group. 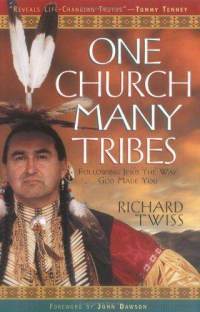 He is the author of the book, “One Church, Many Tribes.” He said that the goal of his talk was to bring to light some of the realities of the Native Americans of the US that are now largely invisible. I have never experienced someone that could make you laugh so hard in one moment and absolutely cringe in pain in the next. For instance, he played a song to start the session on an Indian drum. Implicitly acknowledging the many circles within Christianity that have marginalized the importance of culture and customs, he assured us that this was indeed a “good” drum. In fact, it was even a “Christian” drum. He was sure of this because it said Yamaha on it. And he engraved John 3.16 on it just to be sure. People were still laughing from this when he showed a cartoon with two different images. The first was a crowd of people gathered around a poster of Osama Bin Laden. The group was shouting “terrorist,” and “kill him.” The next image showed the same crowd around a poster of Christopher Columbus. In this instance the crowd was celebrating him and his legacy. This left the room with an uneasy feeling. Everyone had just been part of the national celebration of Columbus Day that week. How had we learned as a country to speak out of both sides of our mouth? How do we condemn one a terrorist yet celebrate another as a national hero? To further shine a spotlight on our inconsistencies as a nation when it comes to our value system, he drew a connection between the Native American experience and the modern debate on immigration. He chuckled at the rhetoric we use when talking about “those” immigrants. Aren’t most of us the children of immigrants? Certainly this doesn’t apply to those whose roots came from being involuntarily brought as slaves from Africa. But the nasty rhetoric most often comes from people whose family trees are traced from immigrants who came to the U.S. looking for greater opportunity. This led to one of Richard Twiss’ funnies lines. He paused when talking about immigration, then without missing a beat uttered, “WE should have had a stronger immigration policy.” The room erupted in laughter. I walked away with a couple of convictions from his talk. First, it reminded me about the importance of language. When he drew the connection between the Native American experience and the immigration conversation of modern times, I realized how language and posture are important beginning points. How was it that otherwise good, moral Christians were able to turn a blind eye to the genocide of Native Americans in the 15th and 16th century? I suppose that is a complicated answer, but part of it is language. We called Native Americans “savages,” and dehumanizing them like that certainly helped detach our conscience from such despicable deeds. It made me wonder if there isn’t something important at stake when we choose to use phrases like “undocumented” vs. “illegals.” Does one humanize, and one dehumanize? I haven’t thought about the historical injustice towards Native Americans as much as I should have, largely because there are not any that I know in the neighborhood that I serve. But that doesn’t and shouldn’t change the fact that we are all tied together in this garment of destiny, and that whatever affects one directly affects all indirectly. I vow to be more conscious and aware moving forward. Here’s a little Chicago history for us. Perhaps this would help guide our engagement locally. I travelled to Pine Ridge a number of times from 1998-99 with friends who had developed a relationship with a church on the Rez. It was and continues to be one of the most profound experiences I’ve had and am continuing to revisit. I’ve kept all of my notes from the trips and notes from conversations. I look forward to what God will do with us. This is great Ivan! Thanks!